First and foremost, a playground must be safe. However, a playground is also a place of adventure and challenge. Creating an environment where children can take risks, push past their comfort boundaries and learn new things is what makes a playground such a wonderful and integral part of childhood. Being challenged helps children learn to process risk, sharpens their decision-making skills and sets them up to be resilient and capable adults. Conquering a fearful and exciting situation fosters self-confidence and reliance in children too. And, if a playground doesn’t challenge children enough, they will simply start to use it in a way it’s not designed for to find the experience they seek. That’s why it’s so important to get the balance between adventure and safety just right in the playground – for Councils, developers, and schools. Playgrounds should have a well thought out mix of equipment for all ages and stages – so younger children can be safely directed to age appropriate equipment while still socialising and learning from older children. Adding different levels through climbing ropes and nets, or textures via sand and water play is a surefire way to spark imaginations. These types of activities safely create risk and adventure for all ages and abilities. The Lake Domain Playground in Hamilton is a great example of a fun and exciting playground that also meets playground safety standards. With a magical treehouse design, it includes a flying fox, wheelchair accessible carousel and the biggest water play area of its kind in New Zealand. Soft artificial grass pads the ground, and the wooden slats of the treehouse are spaced close enough together to keep curious explorers from getting stuck. Of course, no matter how well planned and designed a playground is, there is always the chance of bumps and bruises. Official safety standards are designed with knowledge that children will experience some risk as they play. 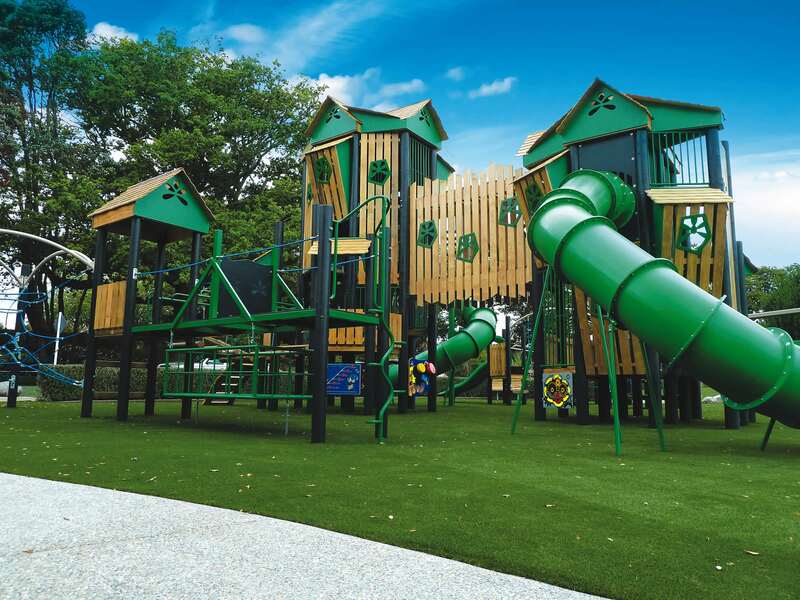 With over a hundred years of playground-building experience, we at Playground Centre make equipment that is exciting, innovative, safe to use and built to last. Our outdoor playground equipment also includes fitness systems and electronic gaming, so children can have a great time outside whatever their interests, age or ability.